Glowforge, the Seattle-based startup which makes 3D laser printers, today announced a $22 million investment round. Previous investors Foundry Group and True Ventures participated in the Series B round, which brings total funding for the 2-year-old company to $31 million. The Seattle startup set a crowdfunding record last year by raising nearly $28 million from thousands of backers who pre-ordered its 3D laser printer in October. The device is different from most other 3D printers — instead of making objects out of plastic strands, it uses a laser to quickly cut and engrave products. The device lets people use raw materials like leather, paper, plastic, fabric, or cardboard and make products with a push of a button. “With this financing, we can deliver not just an amazing product to the people who’ve ordered it already, but we can scale up our American assembly line to make this available to schools, homes, and businesses around the world,” Glowforge CEO Dan Shapiro said in a statement. 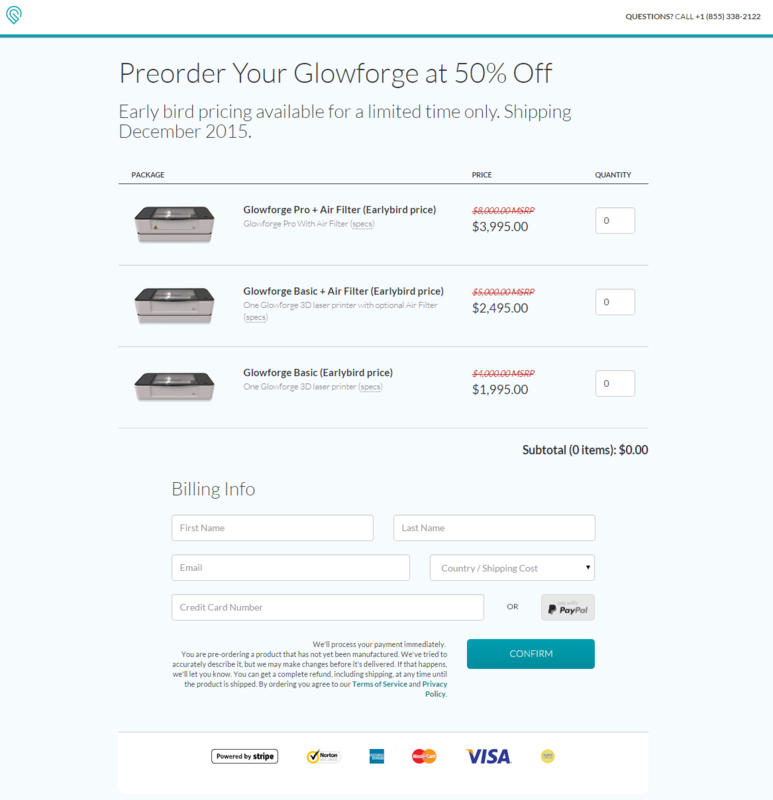 Glowforge has delayed shipments of initial orders twice. The company’s original plan was to start shipping the “first units” in December, two months after the crowdfunding campaign ended. But in February, Glowforge said those shipments were delayed, telling the initial backers who pre-ordered during the 30-day campaign that they’d now receive their printers in June. “We know that more than ten thousand people are counting on us to deliver their Glowforge, and counting on us to make it amazing,” Shapiro told GeekWire in April. Still, this isn’t worrying Foundry Group and True Ventures, who previously led a $9 million Series A round in May 2015 and are doubling down with this Series B round. Feld told GeekWire in April that he wasn’t worried about Glowforge fulfilling its orders. He said he’s invested in dozens of hardware companies from Makerbot to Fitbit and has seen more projects delivered late than on time. Along with smartphone sensors built into the company’s printer, the lasers allow the Wi-Fi-connected device to cut and engrave materials that are curved, uneven, or irregular. Designs can be made in Photoshop, Illustrator, or any software that can produce a PDF or picture; you can print via the Glowforge app or a web browser. Dual cameras on the printer also measure the thickness of material to a precision of four one thousandths of an inch. The device also has no screens and measures 37 inches wide, 20 inches deep, and eight inches tall. You can still order it for $2,395 — deliveries placed today will arrive in March 2017, Glowforge said. This Catan board was made with the Glowforge printer. Photo via Glowforge. Glowforge said today that it will launch its own line of “Proofgrade” materials and a new catalog of printable designs. Glowforge was founded in 2014 by Shapiro, the brains behind the hit kids board game Robot Turtles — one of Kickstarter’s most successful campaigns ever — and fellow Seattle area startup veterans Tony Wright and Mark Gosselin. The company employs 33 people, up from 14 this past December, and has job openings for another 20 positions.